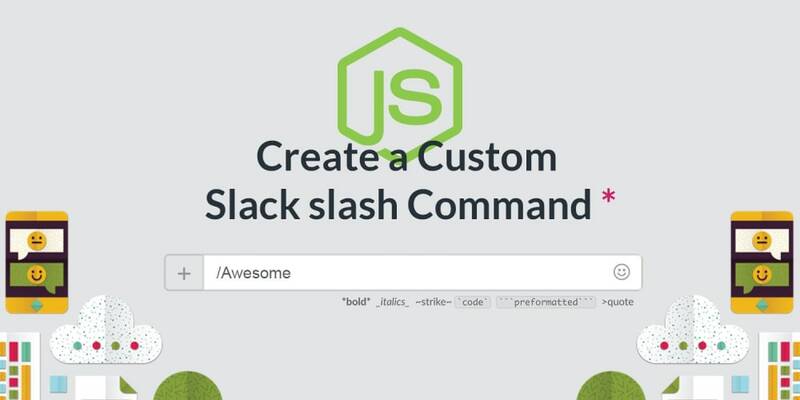 In this tutorial we are going to learn how to build and deploy a custom Slack slash command using Node.js and the Express web framework. If you are interested in creating Slack integrations with Node.js, you might also be interested in a previous article that illustrates how to build a Slack bot with Node.js. Slack "slash commands"... Wait, what? Hi, I am Luciano (@loige on Twitter) and I am the co-author of Node.js Design Patterns Second Edition (Packt), a book that will take you on a journey across various ideas and components, and the challenges you would commonly encounter while designing and developing software using the Node.js platform. In this book you will discover the "Node.js way" of dealing with design and coding decisions. I am also the co-maintainer of FullStack Bulletin, a free weekly newsletter for the ambitious full stack developer. Slash commands are special messages that begin with a slash (/) and behave differently from regular chat messages. For example, you can use the /feed command to subscribe the current channel to an RSS feed and receive notifications directly into Slack everytime a new article is published into that feed. There are many slash commands available by default, and you can create your custom ones to trigger special actions or to retrieve information from external sources without leaving Slack. It offers a very extensive FREE plan. Has an easy to use and well documented API for creating short URLs programmatically. Supports custom domains (I personally use it for my blog with loige.link and for FullStack Bulletin with fstack.link). So, before starting the tutorial, be sure to have a Rebrandly account and an API Key, which you can generate from the API settings page once you are logged in. In order to create a new custom slash command for a given Slack organisation you have to create an app in the Slack developer platform. Notice that, for now, we are passing a sample request bin URL as Request URL so that we can inspect what&apos;s the payload that gets sent by Slack before implementing our custom logic. A user types a slash command followed by some text (the arguments of the command) into a Slack chat window. token: a unique value generated by Slack for this integration, it should be kept secret and can be used to verify that the slash command request is really coming from Slack and not from another external source. Take not of your because you will need it later on. response_url: a special URL that can be used by the server to provide an asynchronous response to slack (useful for managing long lived tasks that might take more than 3 seconds to complete). The application server responds to the HTTP request with 200 OK and a message containing the output of the command that should be displayed to the user. So it should be clear now that our goal is to implement a little web server app that receives url shortening commands, calls the rebrandly APIs to do so and returns the shortened URLs back to the Slack server. The web server: deals with all the HTTP nuances, receives and decodes requests from the Slack server and forwards it to the underlying components. Collects the result from them and returns it as an HTTP response. The command parser: parses the text (arguments) of the slash commands and extract URLS, slashtags and domains. The url shortener: uses the result of the command parser to generate the short URLs by invoking the Rebrandly APIs. For this project we will Node.js 6.0 or higher, so, before moving on, be use you have this version in your machine. server.js: is our web server app. It spins up an HTTP server using Express that can be called by the Slack server. It servers as an entry point for the whole app, but the file itself will deal only with the HTTP nuances of the app (routing, request parsing, response formatting, etc.) while the actual business logic will be spread in the other files. slashCommand.js: implements the high level business logic needed for the slash command to work. It reiceves the content of the HTTP request coming from the Slack server and will use other submodules to process it and validate it. It will also invoke the module that deals with the Rebrandly APIs and manage the response, properly formatting it into JSON objects that are recognized by Slack. It will delegate some of the business logic to other modules: commandParser, validateCommandInput and createShortUrls. commandParser: this is probably the core module of our project. It has the goal to take an arbitrary string of text and extract some informations like URLs, domains and slashtags. validateCommandInput: implements some simple validation rule to check if the result of the command parser is something that can be used with the Rebrandly APIs to create one or more short URLs. createShortUrls: implements the business logic that invokes the Rebrandly APIs to create one or more custom short URLs. This module exports the function commandParser. This function accepts a string called commandText as the only argument. This string will be the text coming from the slash command. The goal of the function is to be able to extrapolate all the meaningful information for our task from a free format string. In particular we want to extrapolate URLs, domains and slashtags. The module url-regex is used to recognize all valid formats of URLs. Then we define our own regex to extract domains, assuming that they will be prefixed by the @ character. We also specify an inline function to normalize all the matches and get rid of the @ prefix in the resulting output. Similarly we define a regular expression to extract slashtags, which needs to have the ~ character as prefix. Here as well we cleanup the resulting matches to get rid of the ~ prefix. With this configuration, the string-tokenizer module will return an object with all the matching components organised by key: all the URLs will be stored in an array under the key url and the same will happen with domain and slashtag for domains and slashtags respectively. The caveat is that, for every given token, string-tokenizer returns undefined if no match is found, a simple string if only one match is found and an array if there are several substring matching the token regex. We process the output obtained with the string-tokenizer module (also using the simple helper function arrayOrUndefined) and return the resulting object. That&apos;s all for this module. In case you want to learn more about regular expressions, there&apos;s an amazing article about regular expressions available here at Scotch.io. The goal of the commandParser module was very clear: extract and normalize some information from a text in order to construct an object that describes all the short URLs that needs to be created and their options. There must be at least one URL. There must be at most one domain per command (if none is specified a default one will be used). The number of slashtags cannot exceed the number of URLs (slashtags will be mapped to URLs in order, if there are more URLs than slashtags, the remaining URLs will get a randomly generated slashtag). A command cannot contain more than 5 URLs (Rebrandly standard APIs are limited to 10 requests per second, so with this rule we should reasonably avoid to reach the limit). The code is very simple and pretty much self-descriptive. The only important thing to underline is that the validateCommandInput function will return undefined in case all the validation rules are respected or an Error object as soon as one validation rule catches an issue with the input data. We will see soon how this design decision will make our validation logic very concise in the next modules. Ok, at this stage we start to see things coming together: we have a module to parse a free text and generate a command object, another module to validate this command, so now we need a module that uses the data in the command to actually interact with our short URL service of choice through rest APIs. The createShortUrls is here to address this need. This module is probably the longest and the most complex of our application, so let&apos;s spend 5 minutes together to understand all it&apos;s parts. createShortUrlFactory: that allows to create a single URL and remains private inside the module (it&apos;s not exported). createShortUrlsFactory: (notice Url vs Urls) that uses the previous function multiple times. This is the publicly exported function from the module. Another important details is that both functions here are implementing the factory function design pattern. Both functions are used to create two new functions were that contains the Rebrandly apikey in their scope, this way you don&apos;t need to pass the API key around everytime you want to create a short url and you can reuse and share the generated functions. With all these details in mind, undestanding the rest of the code should be fairly easy, because we are only building some levels of abstraction over a REST request to the Rebrandly API (using request-promise-native). Ok, now that we have the three main modules we can combine them together into our slashCommand module. So, the main function here is slashCommandFactory, which is the function exported by the module. Again we are using the factory pattern. At this stage you might have noticed, how I tend to prefer this more functional approach as opposed to creating classes and constructors to keep track of initialization values. Allow to switch implementation of the dependency without changing the code of the dependant modules, for example we could switch to another short URL service without the need of changing a single line of code in this module. Verify if the current message body is present (otherwise stop and return error message). Verify that the request token is the one we were expecting from Slack (the request is very unlikely to have been forged by a third party). If the token is not valid stop and return error message. Use the commandParser to extrapolate information about the meaning of the current received command. Validate the command details using validateCommandInput (if the validation fails, stop and return an error message). Use the injected createShortUrls function to generate all the requested short URLs. Creates a response object for Slack containing details about every generated short URL (or errors that happened during the generation of one or more of them). For this last step we also use the internal utility function createAttachment. Also notice that, since the operation performed by this module is asynchronous, we are returning a Promise, and that we resolve the promise also in case of errors. We didn&apos;t use a reject because we are managing those errors and we want to propagate them up to Slack as valid responses to the Slack server so that the user can visualize a meaningful error message. We initialize a new Express app and activate the body parser extension (which allows us to parse urlencoded messages from Slack). We verify if the app has been initialized with all the necessary environment variables (SLACK_TOKEN for the Slack slash command token and REBRANDLY_APIKEY for the Rebrandly API key), otherwise we shutdown the application with an error. We can optionally specify also the environment variable PORT to use a different HTTP port for the server (by default 80). We use our factory functions to generate the rebrandlyClient and initialize the slashCommand. At this stage we are ready to register a POST route for the slash command which will just hook the parse the incoming HTTP requests and pass them to the slashCommand function we created before. When the slashCommand completes we just return its response as JSON to the Slack server using res.json. Finally, we can start the app with app.listen. That&apos;s all, hooray! Let&apos;s move into running and test this Slack integration! export REBRANDLY_APIKEY="your rebrandly API key"
At this stage our app will be listening at localhost on port 8080 (or whatever other port you specified during the initialization). In order for Slack to reach it you will need a publicly available URL. For now we don&apos;t need a permanent publicly available server, we just need a public URL to test the app. We can easily get a temporary one using ngrok. This command will print a public https URL. You can copy this into your Slack slash command Request URL. If you are happy with the current status of the app and you want to have permanently available for your Slack team it&apos;s time to move it online. Generally for those kind of cases Heroku can be a quick and easy option. Beware that you might need to replace awesome-slack-shorturl-integration with a unique name for an Heroku app (somebody else reading this tutorial might have taken this one). This will produce a long output. At the end of it you should see the URL of the app on Heroku. Copy it and paste it as Request URL in the slash command config on your Slack app. Now your server should be up and running on Heroku. Enjoy it and keep shortening your URLs wisely! /willIGoOutThisWeekend: to get the weather forecast in your area for the coming weekend. /howManyHolidaysLeft: to tell you how many days of holiday you have left in this year. /atlunch and /backfromlunch: to strategically change your availability status when you are going to lunch and when you are back. /randomEmoji: in case you need help in finding new emojis to throw at your team members. I hope you will share your creatins with me in the comments here, I might want to add some new integration in my Slack team! Official Slack documentation for building apps: in case you want to understand all the capabilities of the Slack platform. Rebrandly custom short link api: if you want to build some other cool integration with Rebrandly. Node.js design patterns (my book! ): in case you liked the use of the factory and the dependency injection patterns and want to learn some other cool tricks to improve the quality of your code. Unshorten short URLs with Node.js: an article I wrote in my blog that also goes into deep about how short URLs work, it should be a relevant read if you enjoyied the topic. FullStack Bulletin: a free weekly newsletter for the ambitious full stack developer (I am one the founders and maintainers).